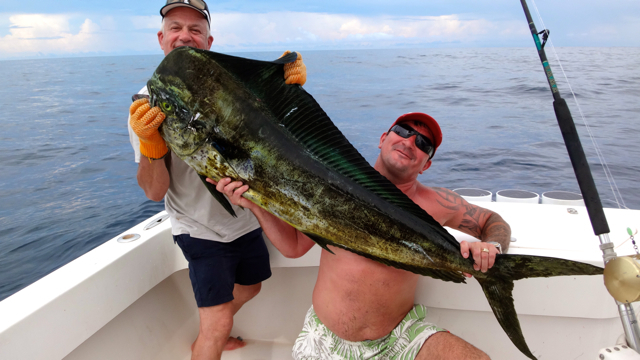 The sport fishing season of 2015/16 has kicked off for us here at Come Fish Panama. We look forward to hooking every group up with all sorts of species and making this season another wonderful adventure for all. If you have yet to book, look no further as we continue our amazing journey of bending all sorts of rods offshore and inshore in the Republic of Panama. This year we have added Estuary Sport Fishing to the line up so anglers can get a taste of all three venues if they wish. 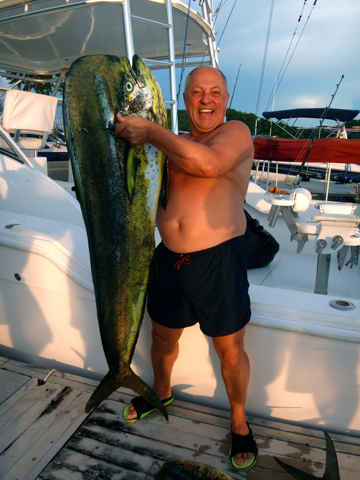 Starting this off this opening season we welcomed Gene Latz and his group from Russia on our 39′ Offshore Custom Walk-around Sportfisherman vessel “Time To Burn”. occasional burst of sun for a bit. It is one of the best months to bend rods on Dorados also know as Mahi-mahi and a few other names. Due to the cold topwater temperature and all the floating debris that comes out of the coastal rivers we keep finding all sorts of monster logs, branches and most of all feeding bull Dorados luring below. These anglers all hooked up with lot’s of bull Dorados, Gene bent a nice rod on a big Mullet Snapper as we were bottom fishing but on the first day the current at the honey hole was really windy and providing white caps of chop did not help out. We still manage to hook up with that nice snapper for him. During the 2 day’s we tried hard on Marlin but we ended up going 0 for 3 as the fights only lasted 20 minutes with one angler and 5 minutes with another on live bait Bonita. The 3rd Marlin just did not catch the trolled Black Bart Lure hook in the right spot. Nevertheless, the boys from Russia enjoyed the bull Dorados that they fought during the trip and left with a wonderful Panama experience. On behalf of the Come Fish Panama team, we once again would like to thank Gene and his group for giving us an opportunity to take them sport fishing. We fully recognize that there are many other fishing charter providers out there and are grateful our customers chose us. We still owe them a marlin so will look forward to hopefully proving them that the next visit down.